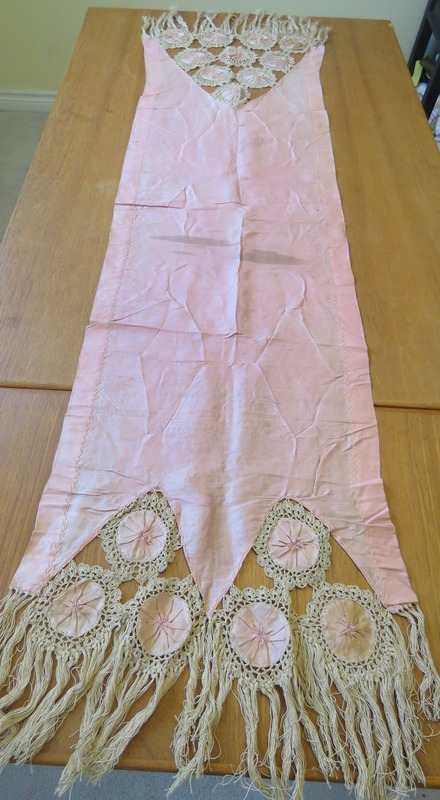 Here is a unique handmade pink silk table runner primitives panel. The silk table runner is completely hand sewn. The antique primitives table runner features a decorative turkey stitch needle work design. The antique table runner has many hand made silk wheel circles at each end that have been decorated with a handmade crochet edging. The antique table runner also has a cotton fringe at each end. 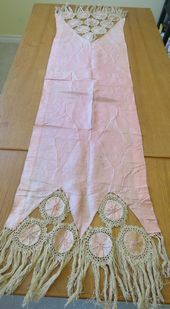 Antique Pink Silk Table Runner Measurement: 63" x 16" Likely circa late 1800's or earlier.